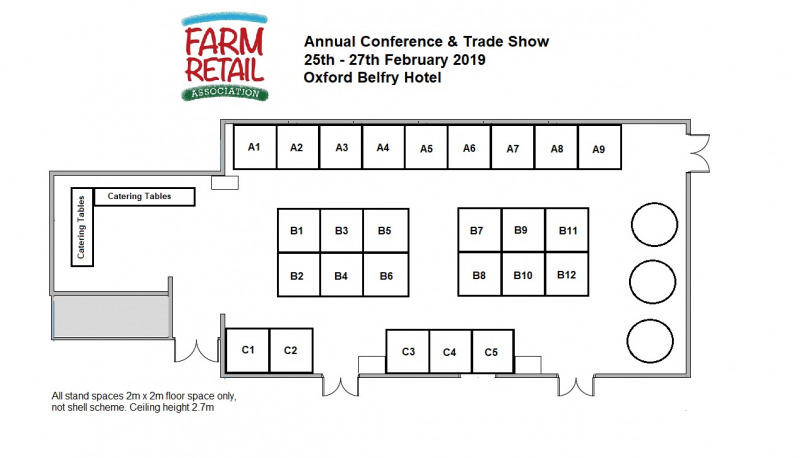 The Farm Retail Association Trade Event has been designed to give industry partners such as you a chance to engage with current and new customers. All tea/coffee and lunch breaks will be served in the Trade Show area. 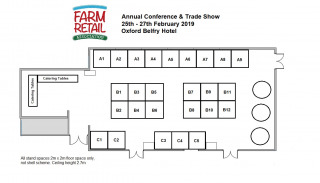 Each stand includes one Exhibitor pass for the FRA Conference to staff the stand, including refreshments and lunch. Additional Exhibitor passes £40 per person + VAT including lunch etc. 1/3rd off stand prices for FRA Associate members. Enter the Coupon Code you were emailed, at checkout. Eg a 2m x 2m stand will be reduced from £450 to £300, saving £150 + VAT). VAT - please note the online booking prices shown below are inclusive of VAT. You will be emailed a VAT receipt showing the VAT breakdown when you book. Select the Stand Number you would like to book from the list of available stands below. Click the Exhibition layout thumbnail image above for floor plan.